CAPE CANAVERAL, Fla. - A $130 million experimental laser communications testbed spacecraft launched Friday could pave the way for quicker transmission of reconnaissance information from U.S. spy satellites back to Earth. The Geosynchronous Lightweight Technology Experiment satellite, or GeoLITE, was successfully delivered into space by a Boeing Delta 2 rocket following a 31-minute flight that began at 1:45 p.m. EDT (1745 GMT) from pad 17B at Cape Canaveral Air Force Station in Florida. The liftoff came 38 minutes late after the countdown was halted at T-minus 18 seconds when a concern was spotted with a reading from the National Reconnaissance Office satellite. Engineers ultimately determined GeoLITE was fine and that the measurement was mis-interpreted. With the countdown recycled to T-minus 4 minutes, a boat was then found inside the restricted launch danger zone in the Atlantic Ocean. The Air Force and Coast Guard quickly shooed the vessel out of the way so the clocks could resume for liftoff. The second countdown attempt went smoothly, culminating with the first stage main engine firing to life and the six ground-lit solid rocket motors igniting to propel the rocket into the sky with a thunderous crackle heard for miles around. Within 26 minutes the three-stage rocket has done its job to achieve an egg-shaped geosynchronous transfer orbit for the 4,123-pound GeoLITE satellite. Spacecraft deployment occurred about five minutes later, off the western coast of Africa near the equator. 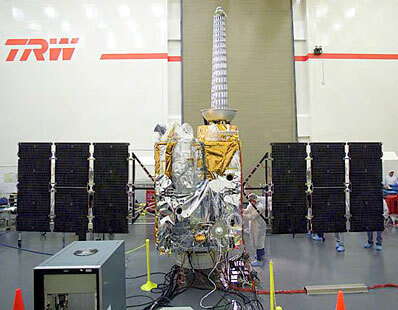 Built by TRW as the first satellite based on the company's new T-310 lightweight composite structure, GeoLITE was conceived as an advanced technology demonstration platform for the NRO. GeoLITE aims to test a laser communications package that promises to transfer more data at a greater speed than possible with current systems. That would allow increased amounts of intelligence information such as spy satellite imagery to be relayed at faster rates. "This is a test for increased bandwidth and speed," NRO spokesman Rick Oborn said. Massachusetts Institute of Technology's Lincoln Laboratory was responsible for developing for the laser communications payload. "GeoLITE is another example of the NRO engaging in cutting edge technology to assure the United States continues to be the world's leader in satellite reconnaissance," the NRO said in a statement. The NRO operates the nation's fleet of spy satellites. By proving the laser system on a relatively low-cost satellite, the NRO wants to ensure the advanced technology will work before incorporating it in future spy satellites. "That is the concept that the NRO has had for several years," Oborn said. GeoLITE is the second such testbed craft to fly. The first -- the Space Technology Experiment (STEX) satellite -- was launched in October 1998 to demonstrate 29 new technologies aimed at lower cost and higher performance spacecraft. But the lessons learned from the STEX mission led the NRO to order additional pre-flight testing on GeoLITE to ensure the satellite would function as advertised. That work, in part, drove up the GeoLITE mission cost from $77 million to $130 million. 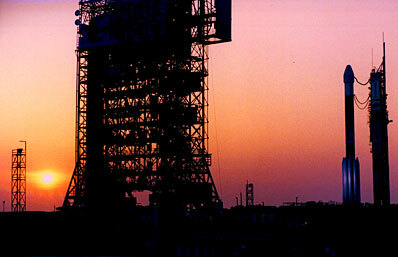 The launch cost was an additional $50-$60 million. In addition to the laser demonstrations, GeoLITE also carries a conventional ultra-high frequency (UHF) communications relay package -- made by Boeing Satellite Systems -- that will be used to transmit classified intelligence information. Over the coming week the satellite will maneuver itself into geostationary orbit 22,300 miles above the equator. 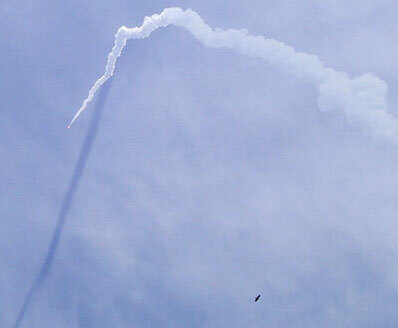 The NRO, however, won't disclose the craft's final parking slot because of the operational nature of the UHF payload. The GeoLITE mission is expected to last nine years. Friday's launch marked the 285th flight of a Delta rocket dating back to 1960. It was the first time an NRO payload had flown on a Delta but not the last. Future spy satellites are scheduled to be carried aloft by the next-generation Delta 4 rocket in the coming years. "As we continue to provide the government with assured access to space with our reliable Delta 2, we are confident that we will also continue to build long-term relationships with organizations like the NRO that will carry into our Delta 4 launch vehicles," said Gale Schluter, vice president of Boeing Expendable Launch Systems. 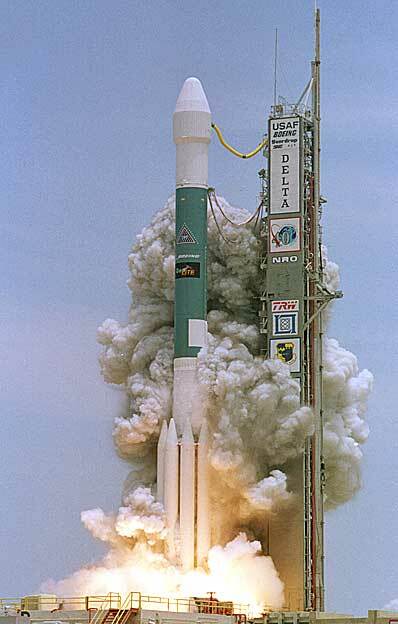 The Delta 2 rocket is currently riding a string of 41 successful launches stretching back to 1997. Of the 96 Delta 2 flights made since the maiden mission in 1989, just two have failed. The Cape's launch pad 17B will now undergo routine clean up before crews begin stacking the next Delta 2 rocket for liftoff on June 30 carrying NASA's Microwave Anisotropy Probe (MAP) that will seek out the afterglow from the Big Bang. Launch site: SLC-17B, Cape Canaveral, Fla.
GeoLITE - Learn more about this NRO satellite. Delta 2 rocket - Overview of the Delta 2 7925-model rocket used for this launch.